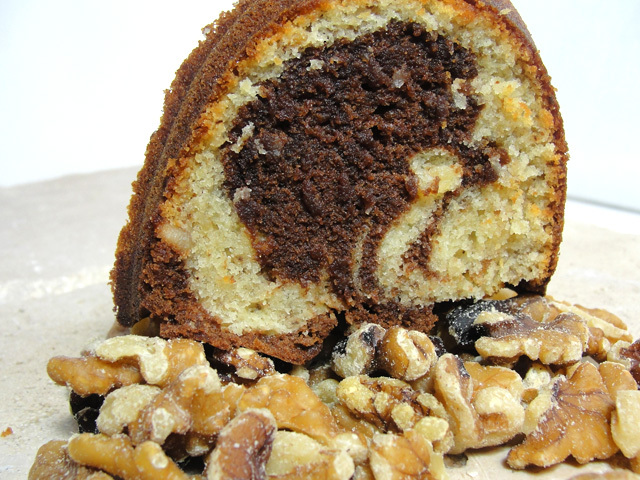 Easy-peasy cake, with very straight forward ingredients – Walnuts, Chocolate and Coffee. I was so confident on the easypeasy part that I started to bake this cake at 9pm, last night (yeah, folks l literally baked on a Tuesday with Dorie). Now, I’m a huge fan of chocolate and coffee combos – HUGE! When I was younger *cough-cough* my mother would order my birthday cake from this German woman, who had this unsurpassed recipe for chocolate cake with chocolate frosting with a touch of coffee both in the cake and frosting. Man, as I write this, I can actually taste it! This was the only cake I would accept for my birthday, and it went on until we moved from Venezuela to the US. The last time I tasted that cake was on my 9th birthday. Sadly, I was too young back then to have the forth sight to ask for that famous recipe, and the woman took it to her grave. I have yet to find it, and let me tell you I have baked gazillion combinations of chocolate-chocolate-coffee cakes trying to duplicate it. So far, I'm still looking. I did not change anything on this recipe (as I tend to do), followed it to the letter. The only thing I did not do was take out the BIG food processor in order to “finely ground the walnuts”. (note to self: buy a Mini food processor for these type of jobs!) So, instead I took put my steak hammer and pounded those suckers until very, very fine. It worked! (mmm, maybe, I really do not NEED that small food processor after all!). And there was the added bonus of pounding out a lot of my frustrations on a really crappy workday too. Win-win guys, we may be on to something: Baking as a form of therapy? 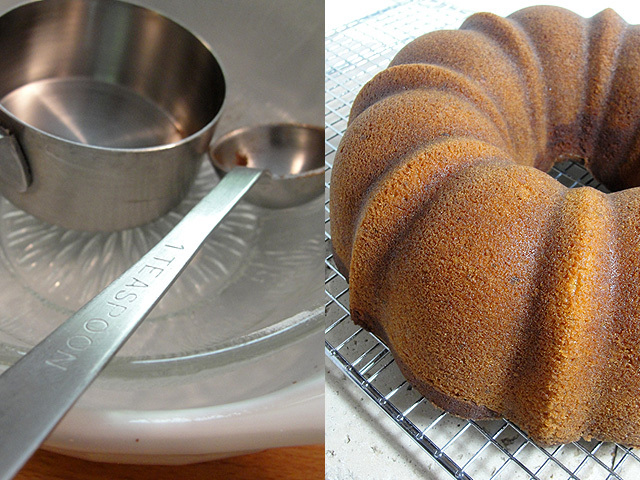 I finish the cake up, decided to try for the gingko pattern, and into the oven it went for almost 70 minutes! With the last 20 minutes driving us nuts with the cooked chocolate smells coming out of the oven and ungulfing the whole house - even the dogs were enjoy it. The cake is soft, buttery and dense at the same time. The chocolate is strong (the way I like it), but it does not over power its vanilla neighbor. Some of the other TWD bakers topped it with glazes, or melted chocolate. I opted to leave it nice and naked, perfect for a very YUMMY midnight snack. And you can find all of the other TWD baker efforts here.